I've released a new version of Diamanda Application Set - 2008-TEST-1.1. It's a small update against 1.0 stable release. Most changes affected layout (new look, fixes in templates, CSS and JS files), but also more generic use of forum topics as comments systems. Also password change has been fixed to work with Django 1.0.*. More CBC (ContentBBCode) - create some useful CBC tags for tables, charts etc. 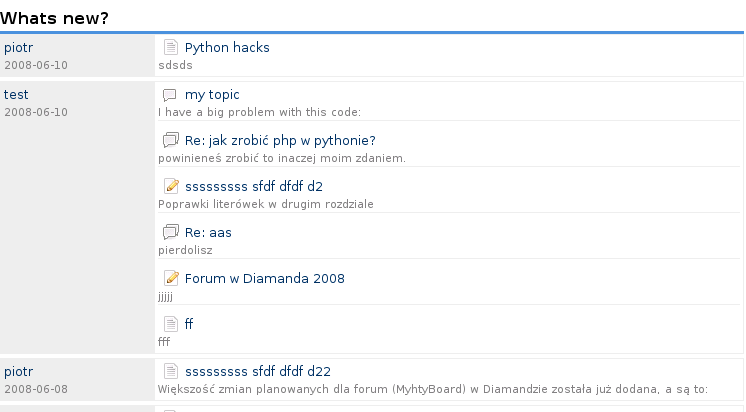 Until now "Diamanda" was a wiki Django application released with MyghtyBoard Forum and some other mini applications. As of today my sites use newer version of those applications. There is no wiki application – instead there is plain "Articles" type application. Other applications – MyghtyBoard, Task Manager, UserPanel, BoxComments, News and other have been improved and/or written from scratch. In the next days, week I'll release the code as a new Diamanda release – "Diamanda – Django applications set".